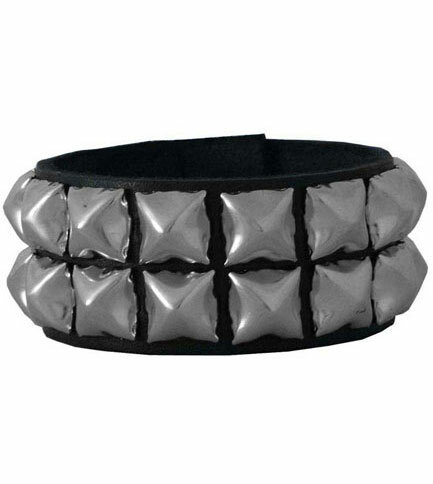 2 row large pyramid stud wristband Medium is 7.5" Large is 8". Made in the USA. The band doesn't irritate the skin, even if it fits very close to you. If your wrist is just below the size of the medium it can be a little hard to fasten it (which is expected), but it won't slide up and down at all, which is great. Very quality made leather, sturdy feeling, has metalic studs, not cheap plastic or knock off aluminum. Has a decent weight to them. The band is about an inch and a half across. I bought two. Good buy.